It is inevitable that at some point your flooring will get dirty, but how do you go about cleaning it? Whether you have carpet, laminate, hardwood, or vinyl, this guide is here to help. To keep your carpet looking good as new, try to schedule a deep clean at least every six months. Before you deep clean your carpet make sure to vacuum first to lift any debris off. To deep clean your carpet, we recommend a steam cleaner. If you have your own carpet cleaner then you are ready to go, if not, fear not you can hire one. There are two methods of deep cleaning, wet extraction (steam cleaner) and dry extraction. Dry extraction involves spreading a dry absorbent compound over the carpet, before vacuuming it with the cleaning machine. Using a water extraction method involves injecting a cleaning solution into your carpet pile and putting it under the pressure of a water-jet nozzle to work it deep into the carpet. The machine then vacuums up the solution along with the dirt, oil and grease that has built up within the carpet, giving your carpet a facelift, pulling the dirty solution back into the machine. When steam cleaning, allow the carpet to dry for 24 hours to allow complete drying, so as to prevent mould or mildew growth in the carpet or padding. It’s important that when steam cleaning, you make sure you do not get your carpet overly wet, so as not to damage the underlay and carpet backing. Too much water can cause shrinking, odour and discolouration. Make sure to choose the method best suited for your carpet type and brand, as a brand may have cleaning guidelines for your carpet, especially if you’re using high-quality materials like https://www.amtico.com/commercial/. Your laminate flooring may be hard wearing and durable, but you still need to keep it in check with a good cleaning routine. The important factor about cleaning your laminate flooring is not to go too crazy with water, as you need to keep water from getting underneath the planks as it can damage your floor. We recommend you dry mop to prevent any damaging of the floor, or when required, use a slightly damp mop for spot cleaning. However, you should never polish a laminate floor, should the finish of a plank look damaged the best option is to replace it. When it comes to spillages, make sure you act fast. Use a clean, dry towel or sponge to soak up the moisture and dry well. It is important to act as quick as you can, as leaving the spill there for too long can stain your flooring as well as wear away the protective coating. The best way to keep your laminate in pristine condition, is to make sure you regularly vacuum. Daily maintenance can prevent scratching, even if your flooring was promoted as scratch resistant, it can still be at risk of floor debris making a mark. Make sure the vacuum is on tile mode, as opposed to carpet, so the beater bar is raised and can’t scratch the floor that way. Keeping a well-vacuumed floor can help maintain the floors feel and finish, but if you’re not using a vacuum it is best to use a soft brush. A standard floor brush has hard bristles which can gradually cause scratching. Of course, at some point, you may feel your laminate needs a thorough clean, particularly when no amount of dry mopping, brushing or vacuuming can remove the stains. Thorough cleaning is best carried out every few months, requiring a bucket with clean, warm water and a delicate floor cleaner or specialist laminate cleaner. 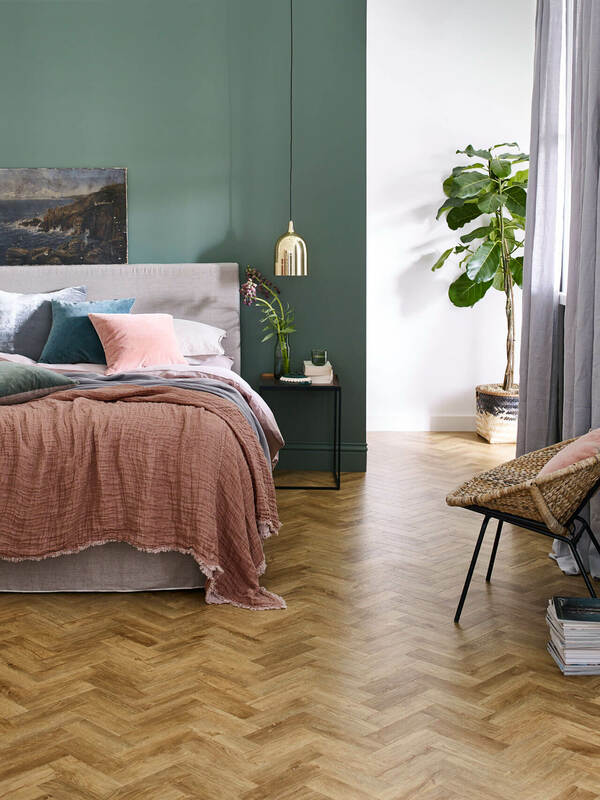 Make sure you find a cleaning product to fit your brand of laminates care rules, especially if you have high-quality flooring from companies like Amtico. Make sure when doing this you wring the mop out well and mop lightly so as not to drown the floor in moisture. Avoid puddles by regularly soaking the mop and wringing it out, ensuring it is just-damp throughout. Before cleaning your hardwood floor, make sure you know what finish it has. If you’re unaware of your floor’s finish, rub your finger across the surface, if a smudge appears the floor should be waxed. If you have waxed wood floors, do not mop and sweep instead. Waxed flooring can be damaged by water, even small amounts. Vacuum regularly to ensure you maintain a clean floor. A great tip for wood flooring scratches is to use a crayon. Simply get a crayon the colour of your floor and rub it on the scratch to fill the gap, before using a blow dryer to heat the area. This will heat the crayon and allow you to buff it with a soft cloth, blending it in to conceal the scratch. Sealed wood floors tend to have a protective coating of urethane, polyurethane, or polyacrylic, to prevent stains and water damage. If your flooring has such a finish, you can create a cleaning solution to keep it in prime condition. Mix a quarter cup of mild soap with water in a bucket to mop with, and thoroughly wring out your mop before use. After you have mopped, use a dry microfiber cloth to wipe up any excess moisture. We recommend cleaning high-traffic areas such as your kitchen once a week, but areas with low footfall need only be cleaned once a month. To get an amazing shine on sealed wood floors, use boiling water and two teabags. Tea possesses tannic acid, a key ingredient in achieving a beautiful shine for hardwood floors. Let two teabags steep in the boiling water for a few minutes before pouring into a bucket. Wring out a soft cloth with the tea and start washing the floor to get a fantastic sheen. Make sure you steer clear of acidic vinegar solutions, as these can dull your flooring finish. Vinyl floorings worst enemies are dirt and chemicals. The first way you can combat these from getting into your home is with a doormat. Any grit that gets tracked into your home is like sandpaper to your floor. Chemicals from asphalt can be invisibly trekked in on your shoes to your floor, causing it to yellow. For any debris that does get in, make sure you act fast and get it cleaned up before the dirt gets ground in. It’s paramount you sweep frequently, making sure to use a soft broom. Make sure when you do give your vinyl a wash, you use the most delicate cleaning methods. Using a damp mop with lukewarm water will do the job, but if soap is required make sure you choose a cleaning product suitable for your vinyl, whether it be Polyflor vinyl or Karndean. For example, no-wax vinyl and wax vinyl need different cleaning products. If you have a wax vinyl clean it with warm water, watching not to rub off the wax, as you will have to reapply it. Always rinse your vinyl after washing with clean, cool water, again on a well-wrung mop, or you’ll leave a residue on the floor. Like laminate, make sure you don’t drown your vinyl. Over soaking your mop and cleaning will a surplus of water can lead to water getting into the cracks, seams, and edges of your vinyl. If water gets in, the glue bonds that hold the vinyl in place can be destroyed, causing curling corners and for it to become loose.